The reACT house, home on the range in the Denver Solar Village. The University of Maryland’s reACT house took second place overall and first place among U.S. competitors in the U.S. Department of Energy’s Solar Decathlon. The event challenges collegiate teams from around the world to design and build energy-efficient, solar-powered houses. First place went to a Swiss team representing four schools: École Polytechnique Fédérale de Lausanne, School of Engineering and Architecture Fribourg, Geneva University of Art and Design, and the University of Fribourg. Professor Ray Adomaitis (ChBE/ISR) was one of the faculty mentors working with the UMD team. In addition, the ISR finance unit staff provided the team with procurement services throughout the Solar Decathlon’s two-year process. UMD’s entry, resilient Adaptive Climate Technology (reACT), seeks to improve sustainability in four ways and includes a hydroponic garden, “living walls” within its courtyard, modular living elements, predictive automation, and design elements that simplify future upgrades to the house. Designed by an interdisciplinary team of students, the prototype house bested 10 collegiate teams from around the globe. UMD has placed first or second each time it has competed in the last 10 years (2007, 2011, 2017). Its WaterShed house won first place in 2011. The Solar Decathlon process—in which teams move from concept drawings to the construction of a physical house—culminates in a nine-day, 10-contest competition in a “solar village” built especially for the event. This year’s contest was held Oct. 5–15 in Denver. The reACT house was built in Maryland, then partially disassembled and trucked cross-country to Colorado, where it was reassembled in the village along with the houses of other contestants. Competitions included evaluations of each home’s performance, design, sustainability, and market appeal. This is the first year teams are eligible for cash prizes; UMD will bring home $225,000. “This prestigious competition engages students from across the country and internationally to develop the skills and knowledge to become the next generation of energy experts,” said Linda Silverman, director of the Solar Decathlon. The reACT house intertwines Indigenous knowledge systems with western scientific thinking to create a structure that represents both thought processes. Team Maryland worked closely with the Nanticoke Indian Tribe, who, for millennia, have harvested the resources of the Delmarva Peninsula while minimizing waste and impact. With the goal of creating a space for First Americans to be self-sustaining and revive their traditional ways, reACT incorporates modern advances to provide the best atmosphere for growth. Modular construction: kit-of-parts allows endless design configuration in size, climate & budget. A mechanical core: high-performance, interactive, environmentally sensitive automated system. A GreenCourt, a marriage of a greenhouse and a courtyard, is the social heart of the house. Gardens and food production: plants support each other creating food webs. A solar attic uses the sun to heat water, dry clothes, and even cook food. UMD’s winning team includes students from the School of Architecture, Planning and Preservation, the A. James Clark School of Engineering, the College of Agriculture and Natural Resources, the College of Education, and programs in several other disciplines campus-wide. 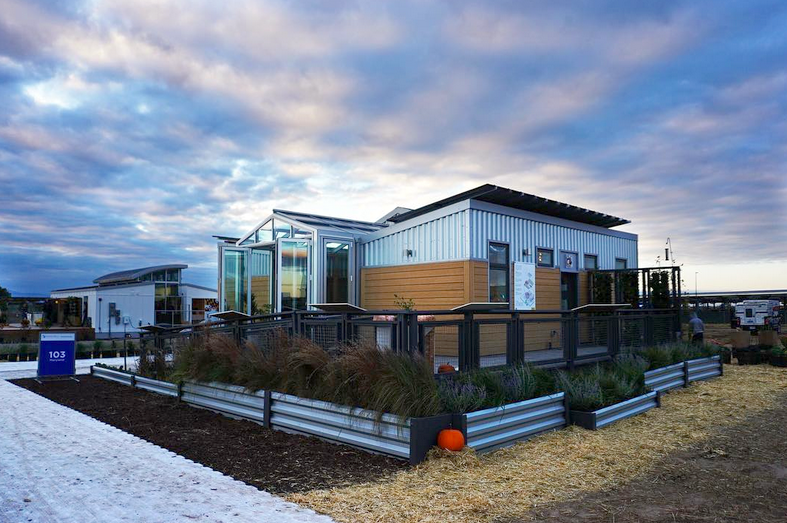 The only Solar Decathlon entry from the D.C.-Maryland-Virginia region, reACT is the university’s fifth entry in the history of the Solar Decathlon competition. The house will return to UMD where it will continue to be used as a research and education center, showcasing projects with regional industry and professional stakeholders. —Thanks to Melissa Andrechek and Chris Hinojosa for the original story on UMD Right Now.